Iwata airbrushes are the highest quality airbrushes available on the market, with a range to suit any application. An entry-level Iwata gives better performance and control than the top of the range in any other brand! Whether you are buying for the first time or upgrading your airbrush, an Iwata airbrush is the only choice for the serious artist and customizer. Click here for more information on Iwata airbrushes. 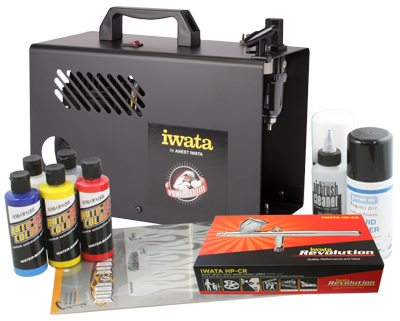 Save money on an Iwata airbrush and compressor, bundled with Auto-Air paints, airbrush cleaners and a choice of Artool stencil - everything you need to get started on achieving the perfect finish to your custom graphics projects. There is a choice of base kits, one for each model of Iwata Studio Series compressor. Each base kit contains an Iwata Revolution BR, CR or BCR dual-action airbrush, but you may upgrade to an Iwata Eclipse, Iwata High Performance Plus, Iwata Hi-Line, Iwata Revolution TR pistol trigger airbrush or an Iwata Custom Micron C Plus. This promotion gives you ultimate flexibility depending on your requirements and budget. Please click on the airbrush models above for more information and select kit options above before adding to your cart. This kit comes with Auto-Air Semi-Opaque Flame Red (120ml), Auto-Air Semi-Opaque Flame Yellow (120ml), Auto-Air Semi-Opaque Process Blue (120ml), Auto-Air Semi-Opaque Brite White (120ml), Auto-Air Semi-Opaque Deep Black (120ml) and an Auto-Air Fast Dry Reducer (120ml), all suitable for automotive and graphics. This kit also comes with an Artool Flame-O-Rama Flame-Dango airbrush template. Alternatively you can choose any Artool template of the same value, or upgrade to any other within the range. Please select your choice of airbrush and stencil above before adding the this kit to your shopping cart. If you can’t find the stencil you are looking for in the options above, please specify which one you would like in the Comments section of the Delivery Information page at the checkout.